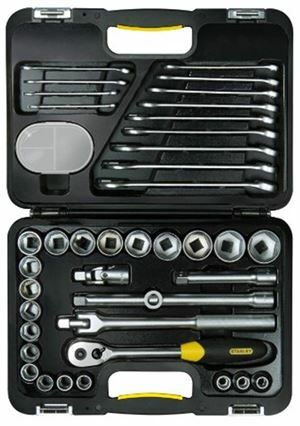 Arguably the most important collection of tools of them all, a socket set will be doing the bulk of the work whether you are a keen home mechanic or a garage professional. 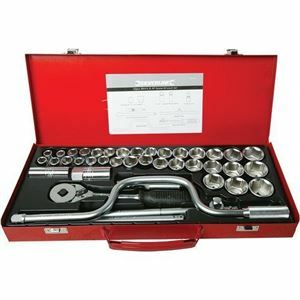 A good socket set should offer a wide variety of sizes and fitments, allow you to work quickly and safely and also be good value for money, whatever your budget might be. 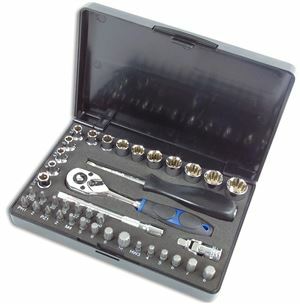 Here are ten socket sets at a variety of price points but all with quality in mind. It certainly isn’t the cheapest socket set that money can buy but collection set from Laser not delivers on quality but also offers a V-profile to each socket that makes it compatible with a wider range of fixings, including Spline, Star, AF, metric and Whitworth. There are 17 drive sockets in total plus 19 30mm drive bits to suit Hex, Spline and Star fixings, with a 72-tooth ratchet for fast and accurate operation plus converter bits and extender bars that convert to a sliding T-bar. 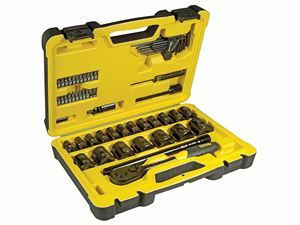 Stanley tools have a reputation for quality and durability, and this professional-standard socket set is equipped for a variety of fitments. 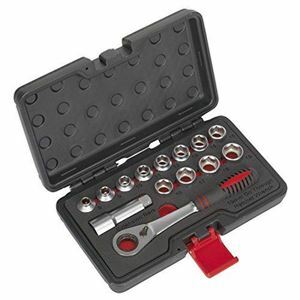 A half-inch square drive ratchet works in combination with 22 Hex sockets between 10mm and 32mm, 13 wrenches from 7mm to 19mm, two extension bars, a breaker bar and a universal joint for hard-to-reach places. A sturdy plastic case keeps all the elements safe and portable too. 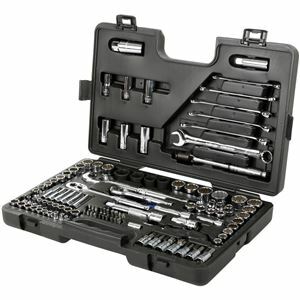 The Halfords Advanced range of delivers higher-quality equipment for the dedicated home mechanic, and this comprehensive 120-piece set should provide enough versatility to tackle a variety of jobs on new and old cars. Three ratchets allow you to work on complicated jobs with a selection of metric and imperial sockets, breaker bars and extensions to suit each one. Add in the 20 screwdriver bits, spark plug sockets and assorted accessories all finished in chromed vanadium steel with a lifetime guarantee and it’s an appealing choice. If your car was built in the last 30 years then there’s a good chance it will use almost exclusively metric sockets, which is where a set like this one from Silverline makes a lot of sense. Without the need for imperial versions it packs 33 sockets into a compact carry case, with extension bars, a speed handle and quick-release ratchet with a rubber handle for comfort and grip. Looks aren’t really that important when it comes to a socket set, but there is something appealing about this retro edition offering from Draper. You get the same high standard of build with hardened and tempered chrome just in a smart orange colour scheme. There are 11 metric sockets from 10mm to 22mm and seven AF sockets, two dedicated spark plug sockets and a 72-tooth reversible ratchet plus extensions for a comprehensive kit. Another set that throws in a dash of style alongside practicality, this Tech3 metric set from Stanley is hard to miss. The case is tough and brightly-coloured, contrasting with the dark chrome finish of the tools themselves. There are 19 sockets from 10mm to 32mm plus extensions, 22 screwdriver bits, a universal joint and a hex key set, and judging by the quality of the finish they might last longer than your car. If good value is your top priority then it’s worth taking a closer look at this set from Laser, which offers an impressive range of sockets for the money. The Alldrive system is designed to work with a variety of fixings including Star, Spline, AF, Whitworth, BSF and BA, so the 13 sockets go a long way. 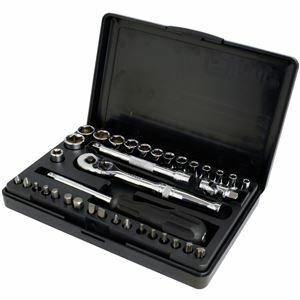 There’s a 72-tooth ratchet, universal joint and an extensior bar plus a 22-piece bit set, all for less than £50. 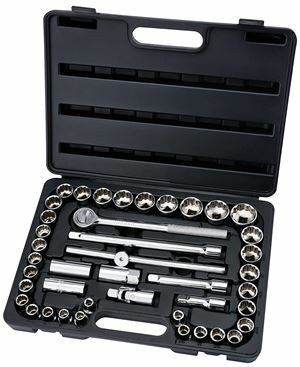 You know you’ll get good value from Halfords, and this 36-piece, 1/4in drive set is perfect for keeping close at hand. 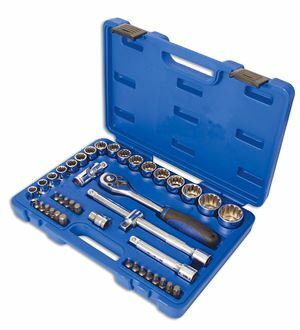 It includes 14 metric sockets and 17 bits with adaptor, plus an extension bar, spinner handle and universal joint to work with the ratchet. Finished in chrome vanadium steel, it comes in a compact plastic carry case for easy transportation too. If you do a lot of work on your cars you may frequently find a conventional socket is too big to get into tight places, which is where this set from Sealey comes in. Each of the metric sockets has a projected length of 13mm, making it much easier to navigate a crowded engine bay. There are sockets from 8m to 19mm and the ratchet is a 72-tooth design with flip reverse and a push-through release for the sockets. 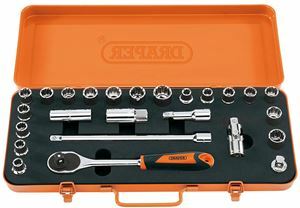 Another high quality but modestly-priced set from Draper, this 42-piece collection includes 22 metric sockets and 11 imperial, three spark plug sockets and handy accessories like extension bars and a universal joint, working hand in hand with the reversible ratchet.